Miss Universe Sweden 2014, Camilla Hansson talks about failures, women issues and more. 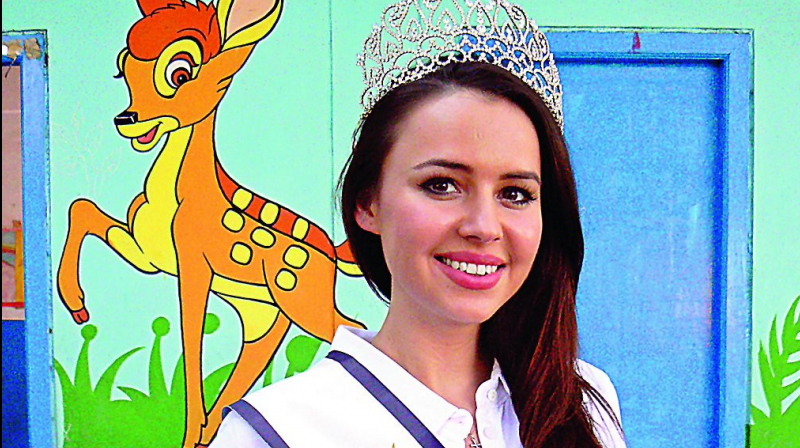 Camilla Hansson, Miss Universe Sweden 2014, was in Hyderabad at the invitation of Dr Satish Sikha from Healthy Kids Happy Kids — the organisation aims to improve the life of underprivileged children by providing them access to education and healthcare. Hansson was involved in numerous activities including mud pot making at Blue Bells School in Turkyamjal village. Says Camilla, “I am here in India for the first time. I am enjoying the warmth of the people and the climate too. When I participated in Miss Universe Sweden pageant for the first time, I did not even make it to top 16. But I did not quit. I believe that ‘Success leaves clues’. If someone is successful, analyse them and look at how they have made it so far. I studied and thought over a lot about how the others made it to the top and worked my way the next time. Never give up. After all, everyone succeeds while going through layers which could at any moment result in a failure. “I am a trained nutritionist and have worked in Philippines and Europe and was part of feeding programmes for children and took part in the fund raising activities through art and tree plantation. I believe in self empowerment for women and will focus on programmes that aim to build their self-confidence. Communication skills and body language are very important for a woman in today’s society. And on another note, it’s also very important to protect our natural surroundings,” signs off Camilla.